Directed by Lauren MacMullan, Head of Animation: Eric Goldberg (2D), Adam Green (CG). Animators: Mark Henn, Dale Baer, Mario Furmanczyk, Patrick Danaher, Alberto Abril, Andrew Chesworth, Anthony De Rosa, Russ Edmonds, Matthew Kummer, Alex Kupershmidt. This short had a very creative promotion, as it was touted as a “lost” Mickey Mouse cartoon, and that the soundtrack would feature Walt Disney’s voice. None of this turned out to be true, Get A Horse! 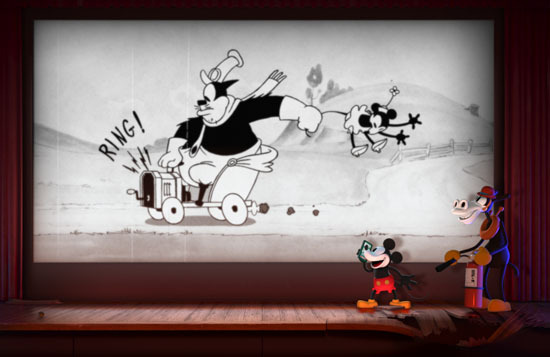 is really a modern experimental film, using a combination of drawn animation in a faux-1928 Disney/Iwerks style and 3D Maya based computer animation – and the sound track uses existing material, not newly discovered Walt. It features Mickey, Minnie, Peg-Leg Pete, Horace Horsecollar, Clarabelle Cow and many other animal and bird characters. The 3-D effects are impressive without being intrusive, such as Mickey being catapulted against the fabric of the movie “screen” before bursting through it and landing on the wooden stage just behind the proscenium arch. The animators got to play with the world of drawn and Maya, as in one very impressive scene, the characters chase each other through two holes in the screen; when they emerge through the hole on the left and step on the stage they become Maya characters and when they slip through the hole on the right of the screen and re-enter the projected image, they become drawn characters again. This was the most difficult scene to work out, as Eric Goldberg told me, since it involved such close collaboration between the drawn and digital animators. This scene only underscores that drawn animation has no problem with flexibility, but Maya based animation has a “dolls come to life” look There’s a funny gag that takes place when the Maya Mickey calls Pete in the drawn world on his cell phone. Pete draws a 1928 Candlestick phone from his pants and answers Mickey’s call! This gag will probably “date” this film the most, but it’s a standout. The biggest difficulty I have with the film is that the style of the characters is really very compromised. It is a combination of some of the hallmarks of the Ub Iwerks 1928 world (like the bodies) and the 1933 Mouse of The Mail Pilot era (the faces). Ub drew Mickey’s face with a distinctive bottle shaped nose, the snout stuck out of the head mass in a nearly straight line, with the smaller bottle shaped black nose nestled in the front of the snout. The Get A Horse models use The Mail Pilot Mickey head with the slightly turned up, and more streamlined snout. This rule applies to all the characters, they have the surface texture of 1928, but if you really look at them, they are sweetened up, and lack the rough, newspaper comic style pen lines that made the Steamboat Willie drawings unique. The basic shapes of 1928 characters are not so much perfect circles as slightly squared circles. Rounder characters were easier to draw and they became rounder as the 1930s rolled on. If you are going to go by a strictly 1928 sensibility, the film makers had only four Mouse cartoons to use as models: Steamboat Willie, Gallopin’ Gaucho, Plane Crazy and The Barn Dance. These four cartoons were almost completely the work of one animator, Ub Iwerks, with support from Les Clark, Wilfred Jackson and Johnny Cannon. The animation in Get A Horse is very good, but not really of the 1928 period. The action is mostly on ones, very frantic throughout, and has the total immersion, roller-coaster mind set of this century’s animation. The Barn Dance has one of the best sequences ever done with the silent era style, and that’s when Mickey is dancing with Minnie and his shoes grow to enormous size as he clumsily steps all over her body (see frames below). Although author and historian Mike Barrier would characterize this kind of thing as “violation of the body”, which in his view held back the development of personality in drawn animation, I see it as true CARTOON acting. Mickey’s shoes don’t grow big just for the hell of it, they grow to convey his utter ineptness in dancing. Minnie’s body isn’t stepped on and stretched and distorted because Ub was playing with the medium; her body is “violated” to show what’s in her mind and her attitude toward Mickey’s dance steps. In Get A Horse, there is some “violation” going on, as when Mickey creates a step ladder out of his leg for Minnie to climb upon, but it doesn’t serve the acting well, there is no real reason for Mickey to make a step ladder out of his leg than showing off the flexibility of his cartoon body. The voice track to Get A Horse is a combination of dozens of lifts and clips from existing Mickey Mouse sound tracks, equalized and mixed to form a new track. Some of the little exclamations and “Heys” work well, as the 1928 Mickeys had no real dialog. Because a lot of the voice track for Mr. Mouse Takes A Trip is extant “in the clear”, they used lines from that cartoon. However, to put the “I had a little cat once..” speech from Mr. Mouse, in the 1928 Pete’s mouth, seems really jarring. For one thing, Pete was a big Palooka of a CAT in his first appearances, dating back to the Oswald series. By 1940, he had evolved into more of a man than a cat, so his fake reminiscences about a pet cat which he makes in his role as a Pullman porter in Mr. Mouse, seem to work with his more human self. But for a big 1928 CAT to talk about having a little cat for a pet seems strange. Pete’s punishment in Get A Horse, falling in and out of the screen, stumbling into a cactus and so forth, is a tour de force of 21st century animation, it does not recall Iwerks 1928 so much as a contemporary animation romp. Oddly enough, what happens to Pete recalls what happened to the bad Bobcat in Harman and Ising’s Poor Little Me (1935), he fell in a cactus too! The one scene of dialog between Mickey and Minnie toward the end that has actual lip sync is a step in the right direction, as the exaggerated mouth shapes look ahead to Mickey’s Follies from 1929. That picture has an extended song sequence in which Mickey sings his new theme song, Minnie’s Yoo-Hoo. Johnny Cannon (my best guess) animated some of the zaniest and most exaggerated mouth action of all time as Mickey sings “the crows Caw-Caw and the mules Hee-Haw”; the action looks like he studied his mouth movements in the mirror and grafted them onto Mickey’s face, whether they fit or not! Of course, Minnie’s Yoo-Hoo was NOT Mickey’s theme song in 1928, it hadn’t been composed yet. To get this film made at all, must have been an end-run fluke. When I worked at Disney, we used to dream of a project in which we could use a 1920s attitude toward the body in a contemporary story, using old character models, but no one wanted such a picture. Anyone who wanted Mickey to look like the 1928 character was just out of luck, it just “wasn’t done”. Mickey as a corporate symbol was an untouchable icon then, so getting to do a project like Get A Horse, must have been tremendous fun, despite the obvious design compromises. I’m sure it was quite an accomplishment just to leave Mickey’s hands black! When DisneyCo won Oswald Rabbit back again, I had hopes that maybe some 1926 type animation might be attempted to support Oswald’s re-birth. Instead, DisneyCo green lit Epic Mickey, a series of videogames which recast Oswald as a strictly Maya based character with a moderately flexible body. (Oswald does make a very brief cameo toward the end of “Get A Horse”, waving to the audience from the wings of the stage.) It’s great to see at least a little bit of Iwerks/Harman/Ising/Freleng 1920s style thinking re-enter the canon. Maya animation and 3-D glasses were stirred into the pot to make the project contemporary enough to be green-lighted. We can only hope that if Get A Horse is successful, more imaginative 1920’s style drawn cartoons will emerge from the mix. Watching this on Sunday at the NYC Film Forum, I immediately recalled MUPPET*VISION 3D at Disney World. That is, I’m afraid, what GET A HORSE! is at its core: a gimmicky, frantic film you’d see on a ride at a theme park. I wish the actions and animation were easier to read. With the hand-drawn footage being on that “movie screen” the whole time (and with the impediment of the 3D glasses), I could hardy make out anything at all! Gimmicky, bah. 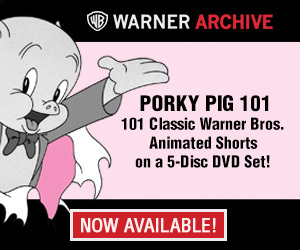 At least it sounds better than the Marvin the Martian 3-D cartoon that Warners had at their parks aand stores. Other than the odd ending with Daffy’s most bizarre disguise, it wasn’t so memorable. I do agree that the animation is a little more fluid than a 1928 short, but I really enjoyed it. A perfect assessment of the strengths and weaknesses of this fun short. I think the world of you, and no one knows this stuff better than you. BUT… “very compromised”? Please. Take a look at your very own post: Color frame from “Get a Horse” above, “The Barn Dance” (1929) directly below. Both have the same exact stick-up nose and snout, and I can provide many more examples if you like, all from the correct time period. Did he have the nose you describe? Sure (and we use that one too for certain angles and expressions), but he had this one too. Even the classic Steamboat Willie “Mickey at the wheel” pose has this nose. You’re certainly entitled to your well-informed opinion, but I believe you do a disservice to all of us who worked uber-hard to get this right. Sorry if my words were not well-chosen. I only saw this short one time, so I am working from the fleeting impressions I received from that initial viewing. I’m sure a ton of hard work went into the making of “Get A Horse”, you would know that better than anyone. I guess because the short is such a mega-media sensory blast, it is at root quite different from the feeling watching an old 1928 Mouse cartoon has on me. “Steamboat Willie” is actually pretty intimate, as Mickey spends almost the whole film playing farm animals like instruments, most of the compositions are very simple, one Mouse, one animal. In “Get A Horse”, the compositions are not simple, and there is a whole lot going on all over the screen. I’d like to see it again just to view what I missed the first time. I have a theory that concentrating on one character builds intimacy, and putting the character in an interactive environment with a lot of other characters does not. The snout was just a small part of why this short does not say “1928” to me. 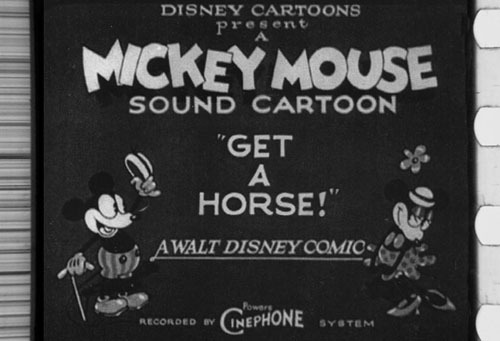 But “Get A Horse” is much more than simulating a look, and it’s really not even about Mickey so much as it’s an experimental film demonstrating the difference between drawn animation and CG! And on that level it works very well, should get a lot of awards and favorable notices. I’m not trying to show disrespect to the fine talents who worked on the production, just expressing feelings about it. I was absolutely delighted to read your careful (and passionate) analysis of the 2D animation of ‘Get a Horse’. I’ve been waiting for someone to come along and really dive in, so thanks. But: Mickey heads like ‘The Mail Pilot’? Hmmn. Post an image of one of those beside your ‘Barn Dance’ heads and let’s take a closer look. Any problems you may have with the shot compositions, you can lay at my door, as I storyboarded most of the short, and all of the 2d section. I realize some of the shots in the early section were wider, more crowded, and more sophisticated in terms of cel levels than would have been possible in 1928. As it was, I was always being urged to have the plot spool along quicker than was normal for the era, and to have Mickey burst out of the 2d as early as possible, in case we lose the mainstream audience. So sometimes the shots had to do double duty, and that made them more complex. It’s wonderful to hear from a group that would have wanted it to be as accurate to year 1928 as possible, as we were. Bear in mind though, even in that one year, change was incredibly fleeting: Mickey had black spatula feet in ‘Plane Crazy’; Pete was a regrettable, drooling Mexican stereotype in ‘Galloping Gaucho’, and Clarabelle was just a naked unnamed cow. And even Minnie had those odd, distracting breastplates in ‘The Barn Dance’. Why did they make her seem even more naked? Fascinating. Things in 1928 changed from short to short, it seemed, even month to month- which makes it such a seminal, interesting time. So we settled on character models that covered a slightly larger bit of collective memory-so more people could immediately recognize these characters. Thanks, also, for including the animator credits (you are the first to do so), but there are just a couple inaccuracies. Should read: (In addition to Eric and Adam) Animators: Mark Henn, Dale Baer, Mario Furmanczyk, Patrick Danaher, Alberto Abril, Andrew Chesworth, Anthony De Rosa, Russ Edmonds, Matthew Kummer, Alex Kupershmidt. I want them to get credit for their wonderful work, 2d or cg, year 1928 or year 2013. Lauren, I’ve amended the animation credits in this post to reflect the changes and additions you indicate. Outside of seeing the film, I don’t think the accurate credits are listed anywhere on the internet. Thanks for helping us set the record straight. And congratulations on creating such a great short. I submitted an update to IMDB to reflect the correct animator credits. Thanks for pointing it out Jerry! It’s unfortunate that the audience must be told to don 3D glasses before they watch “Get A Horse,” as that alone kills the surprise that 3D will somehow come into play during the running time of this cartoon. As long as special eyewear must be used to experience the 3D illusion, there seems to be no way around this problem. Effects specialist Douglas Trumbull once thought that a higher rate of projection alone might provide something similar to the 3D effect and he indeed tried such a thing with his Showscan process but animating in Showscan at 60 f.p.s. would be insane and it wouldn’t really result in 3D, either. 3D needs a new, supplemental eyewear-free paradigm, just so all those theaters can be rewired yet again. This is a job for brains and money. Well, parents can take their kids to a 3D showing of “Frozen” and see this. It can keep the surprise just a little bit. This is why I miss 35mm. Couldn’t Disney a huge company that they are throw us a bone for once and make this in oldschool cel animation? I have no sentimental attachment to cels as a medium. They did nothing for animation except to allow layering of imagery. It was the best solution available at the time to replace the “slash and tear” method, but any aesthetic appeal is due to nostalgia. I would like to see a Mickey short done using cels and ink for the nostalgia value, but I like even more the freedom computers give us to use any medium (simulated oil, pastels or what have you) for animated characters on top of static backgrounds. You obviously didn’t see Frozen when you called it “clilche awful”, because it is anything but. It was only the marketing that made it seem that way. I think it looks fantastic. Thank you guys for keeping this art alive. Despite some liberties taken as well as not having Ub there to guide the process, I’m sure it’ll be a great addition and celebration to the Disney collection. I’m looking forward to this FAR more than Frozen. Is it really any stranger than a mouse having a pet dog (which happens to be smaller than himself)..? My only real complaint as usual is the short moves too fast. Unfortunately that just seems to be unavoidable with a lot of animated shorts these days because, as Lauran mentioned, suits want the short to be fast-paced to keep the audience’s interest (because, we’re goldfish, you know). And, also, because of the lesser running time, more gags try to be crammed in. Overall, I liked the short. I have not seen the full short yet, but I appreciate this excellent, expert analysis on the film and its flaws. It really does seem like they tried as hard as they could to recreate that 1928 animation but doesn’t quite work for several reasons. I still enjoyed the clip I saw but the CGI was kinda obvious. This short has definitely had my attention since it was first announced, and am glad to see that it’s been generating so much discussion. For a short that seeks to emulate a previous era, it succeeds more than most – Futurama’s “Reincarnation” comes to mind – though it absolutely carries traces today’s animation sensibilities. When watching it from a historian’s perspective, it can be aggravating when the short doesn’t quite match up to the period-tropes, but the only way to really accomplish that would be through a more focused study rather than a modern mainstream short. “Get A Horse” respects and celebrates its source material, and invites the audience to do the same. It was refreshing to see the gags in the ’28 world embraced rather than laughed at; at no point did it seem that an old trope was presented as out of date or silly. Thank you, Lauren and co.! It would be nice to someday see a short that aimed to truly recapture the animation style and gag-approach of early Disney, but until then if “Get A Horse” is generating a wider interest and discussion there, that’s terrific. Animation from that period has generally been lopped together, it would be great for audiences to distinguish the various styles and approaches prevalent back then. Being an animation enthusiast more than an animation scholar I enjoyed the short and from what I had heard about it ahead of time I expected it to be primarily a lot of fun visual gags supporting one overarching fun visual gag and it fully delivered on that premise. I think one factor that necessitates it having to move quite quickly is that today’s audiences aren’t as used to shorts. The majority will go expecting to see some previews and then to have Frozen start so they might think Get a Horse! starting up instead is a mistake that they have to go tell some theater employee about (“Why is some old black-and-white cartoon playing?”) so they have to arrive at the point pretty quick that there really is a contemporary element present. It must’ve been fun to closely approximate the 1928 style. I know we can’t expect a plethora of them now, but I wouldn’t mind seeing one new one completely in that style. I’d had an idea before of a Mickey short that was CGI but black-and-white and set in the 1920’s and playing out an abbreviated version of Charlie Chaplin’s Modern Times , with Mickey as the everymouse beleaguered by the increasing mechanization of society. There’s a scene in Modern Times where the Tramp character and his girlfriend go to a department store and she’s excited to see a Mickey Mouse doll for sale there. It was then easy to envision a black-and-white CGI Mickey and Minnie going to a 1920’s New York department store and Minnie being excited to see a Charlie Chaplin doll for sale there. That wouldn’t be a problem if cartoon shorts were ADVERTISED on television, like they were in the 90s. I finally got to see it today, and the audience was delighted to see Mickey on the big screen. No one left the theater to complain. I think the Walt Disney logo was sufficient to keep people in their seats. While “Get a Horse” was a little too frantic for my tastes, it was an amazing piece of work and got a big round of applause from the audience. You cant ask for a better reception than that. I enjoyed the short immensely. Being in my forties, I obviously have only seen the old shorts on TV and only then when I was a kid back in the early days of the Disney channel. While the short may not be a perfect replication of the 30’s style, the truth is that the short was not designed to do so. This is an homage to that era and a way to bring the characters into the modern age and thus make it enjoyable for kids and their parents. I believe in that aspect, it was a success. As to the harping on the technical aspects, animation is an art form. Like all other arts, style, technique, and skill changes over time based on conditions of the time. Therefore, while today’s animators maybe great artists, they will never be able to replicate the style of the 30’s to any expert’s satisfaction. Nor should they be expected to. All they can do is pay a homage, as they have done here, to remind us of all the great work artistry associated with a bygone era. Bravo to anyone who worked on ‘Get A Horse’… saw it in the UK last night accompanying ‘Frozen’ (also excellent btw, probably the best since the Katzenberg era). The 3D projection was excellent but best of all was the audience reaction to seeing Mickey back on the big screen. Kids loved it, were laughing their heads off, and it got a big clap before the main feature started. Well done! Purely as a punter, it seems like Lasseter’s tenure is finally paying off. Back on the MouseWorks TV show, we did a faux black and white short called Mickey and the Goat Man…we went so far as having Wayne Allwine come in and re-record all his lines in a way to try sounding more like Walt. He even used the microphone that Walt used on the early Mickey shorts. I guess all his years as a Disney sound effects man offered him the advantage of knowing where that particular piece of equipment was in the Imagineering building. We did the scratches on the film and went for the rubber hose look, however, I think we came up short…the design was not quite enough like the early 30s cartoons, and quite frankly, there was about 10x more talking in the cartoon than any early Mickey film would have had. To do it right, we should have relied almost solely on music and timing it to that. The inspiration for the short was the song the Squirrel Nut Zippers recorded for the show’s main title which was rejected by Peter Schneider. We pulled a catchy bit from it and used it where Mortimer hits Mickey with pies for their act. I think it would be great if the studio would put all the MouseWorks or House of Mouse episodes out on DVD, but so far, there have only been a few Donald Duck cartoons released on one of the Silver Classics tin sets. Here’s the link for it, if anyone wants to see it. It was boarded by Sean Bishop, and the designs were done by Bob McKnight. Saw the short as part of the nominated shorts compilation. It was fun, but I found it more annoying than breathtaking. I’d be interested to know if there is another Mickey Mouse cartoon from that era where Mickey knows that he is a film character, and uses that knowledge to antagonize his foe? For me it had the unavoidable sense of having been refracted through Duck Amuck. Without the intimacy, since Mickey sort if turns into the revenge gang leader.